Last Saturday morning the postman rang twice … and left me a new book to read ! 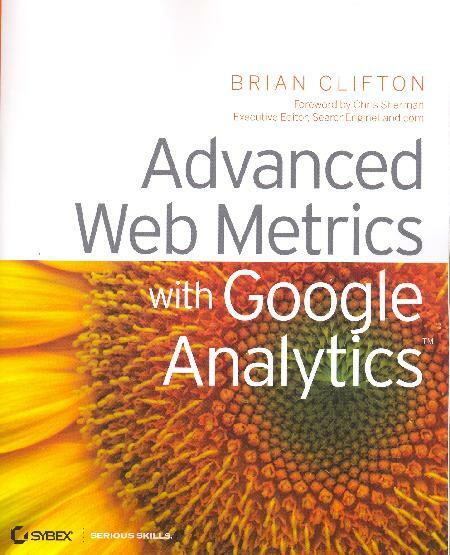 Advanced Web Metrics with Google Analytics by Brian Clifton is a mammoth effort that took a very long time to write and bring to printing. I met Brian at the RIMC and he was already at work on the book, available on Amazon. Yesterday I got a call from a (hosting) Client based in Rome and in the travel sector. They asked some questions about their (general) statistics plan and then ventured off far beyond the boundary of how many visitors there had been over the past 3 months … as people are spending more and more on their online visibility, they are asking more and more questions on how that money is being spent and the only way to get some good answers is to investigate with web analytics. A tip of the hat to Brian for a job very well done ! Sound great, thanks for the heads-up will go straight to amazon and order it. Nice post. I love good books that people recommend…there are some poor books out there, but who has time to waste on a poor book. Always glad to get recommendations…I may have to get this one. I’ll have to check it out. I have really been trying to get more into Google analytics and have been looking for good book recommendations. congrats to Brain Clifton to publish it after a long time. Ugh, I know this is probably something I should read but…I really really really don’t like Analytics 🙁 I have the hardest time getting in to it and a whole book about it..? Grrr. Useful information. I will check it out on Amazon to see whether there is any discount if I buy it with other books together. I really like Google Analytics, it’s helped my sites enormously. Am going to get hold of this books – sounds good. Marketings need to understand that it’s better to have low volume that has a high conversion rate rather than high volumes of traffic with no conversions. I’ve installed Analytics on several of my sites and have just scratched the surface of it’s capabilities. I Didn’t know there was a book available. Thanks, I’ll have to check it out. This is an excellent book. I’m also a big fan of Avinish Kaushik. Most of his stuff is using Google Analytics, though he throws in some other analytics vendors as well. I’d highly recommend reading some of his stuff as well if you are getting serious about web analytics.